OMFG!!!!!!! I am in LOVE. In love with Mary Elizabeth and her beautiful words and storyline. In love with her ability to make a story original, full of heart, and make you beg for more. I am in LOVE with her raw characters. I am in love with LOW. So how can this one book make me fall hard. It's simple. LOW was so much more than a bad boy from the wrong side of the tracks falling in love. This book was about the raw, realistic, poignant tale of a young man who was desperate. Desperate to put food on the table. Desperate to have a roof over his head. Desperate to live. Desperate to SURVIVE. Lowen Seely was a young man who had to fight in order to survive the harsh and gritty reality of life. His life was not the perfect house with the white picket fence. His life revolved around having just enough spare change for measly crumbs. His life was made up blood, sweat, and tears. And when Lowen made that choice to steal for a jar of peanut butter and bread, his life was forever changed when he knew he assaulted the store owner. Lowen Seely is a criminal with a record. When Lowen served his time in prison, there was one thing that meant the world to him. His girl. Posey Ashby loved Lowen Seely with all her heart. She didn't see a bad boy. She didn't see an uneducated man. She didn't see a criminal. What she saw was the boy who owned her heart. The boy who loved her fiercely. The boy who saved her. The boy that gave her the reason to breathe and wake up each morning. The boy who brought light into her life. The boy who has a beautiful heart. The boy that she loved. Poesy Ashby is the definition of ride or die. She stood by Low's side no matter what even while he was in prison serving his time. So when Low was done serving his time, Posey and Low thought that they could finally live their life together. But when it became difficult to get by financially, Low and Posey begins to experience the financial hardships. For Low, it was hard for him to see his girl struggling with school and work. And it also didn't help that job opportunities for ex-cons were limited since many people saw the bad boy with a tattoo on his face and a criminal record. And so when Lowen and Posey reached rock bottom, they did the only thing that knew they had to do. They made the choice to rob banks. The choice to rob a bank is not the ideal situation to solve any problems but they were desperate. Desperate to survive the harsh reality of living on the wrong side of the tracks. Though I will not make any excuses for their choice, I will say that Low and Posey was written in such a way that made you FEEL for them. Feel their guilt. Feel their love. Feel their heartbreak. Feel their vulnerabilities and insecurities. Feel their fears. 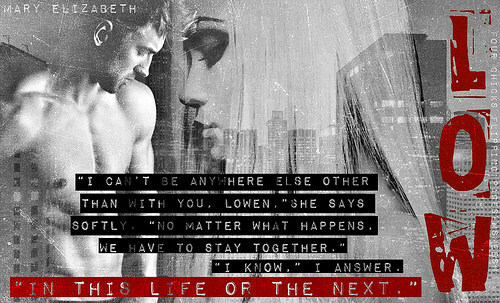 What truly made me LOVE this book was how Mary Elizabeth brilliantly made the story of Lowen and Posey so raw. There was no hidden facade. Mary Elizabeth stripped her readers to see that Low and Posey are flawed. They made their own choice. Right or wrong they made a choice that they own 100%. And most importantly, Mary Elizabeth allowed her readers to see beyond the criminal acts but see that even crooks love, regret, dream, and break. Even crooks like Low and Posey are capable to have TRUE LOVE. A love that will forever be etched and tattooed on their hearts, mind, body and soul. An unforgettable love. And most importantly even crooks can have love that is worth dying and fighting for. LOW was utterly addicting and beautiful. Mary Elizabeth paints a literary tale of beauty, grit, raw emotions, and a palpable love story that will have you falling hard for crooks. 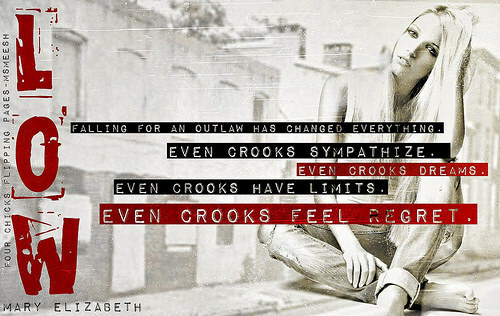 Yes, even crooks love. Though this is my first Mary Elizabeth book, this definitely won't be my last. I loved how Mary Elizabeth can write a fresh modern twist to Bonnie & Clyde and have readers begging for more. Mary Elizabeth wrote a book that held readers like my hostage as we were wrapped up in a whirlwind of raw emotions. I love that this book is not your typical bad boy romance but a story that was built on the foundations of family, desperation, survival, and love. So if you are ready to fall hard for crooks, then I highly recommend you to read LOW by Mary Elizabeth and get lost in her gorgeous prose.